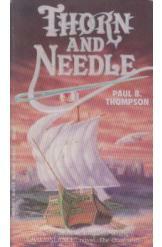 Thorn and Needle by Paul Thomson, Sci Fi. Book is in good condition, all pages intact. Miyesti, a city of advanced technology in an otherwise primitive world, is seen as a place of piety and perfection. It is therefore to the surprise of many when a shifty nobleman and his sullen companion come to Miyesti. His presence raises questions about what they came for, or what they fled from.